Bulletstorm: Full Clip Edition doesn't offer a great deal of new content, but new visual polish and the quality and fun of the original game means that the package holds up well. At first glance, it’s kind of confusing as to why Gearbox and People Can Fly would pick Bulletstorm out of all the available titles in their catalogue for the remaster treatment. Look a shade further into it though and the reasoning is relatively clear. Despite providing some top class gory fun and being critically acclaimed when it released back in 2011, it didn’t rack up the huge sales that it maybe should have, mainly because it hit the shelves in the same week as Sony’s Killzone 3. So, in an age where pretty much everything is ripe for the remastering, the developer spied the perfect chance to apply a bit of spit and polish to proceedings and give players the opportunity to get their run and gun on. And even though the resulting package is far from perfect, I’m glad they did. In Bulletstorm, you take control of Grayson Hunt, an exiled (and now drunk) former member of the elite assassin group Dead Echo. Across a story that revolves pretty much purely around Hunt getting his revenge on his former commander, you’ll use your choice of weaponry to take down all sorts of ten-a-penny mutated freaks that stand in your way. Unlike other FPS titles though, the way in which you take down your foes is absolutely key. You’re rewarded for fancy shots and for cleverly dispatching those that seek to eat your face with a little bit of style. It isn’t just down to where you shoot them, either, since with Hunt’s “leash” ability, you can grab and pull an enemy toward you from afar. Yanking them into a spiky cactus will give you a bonus. Kicking them into a bunch of electrical cables will similarly award you. Throwing them off a bridge drops some score for you too, as does crushing them with a hot dog cart, setting them on fire, or leashing one, headshotting a second, then doing the same to the first guy that’s still careening through the air towards you. It’s a mechanic that you would think would wear out its welcome, but with 135 or so different skillshots available to mark off your list, that just isn’t the case. There’s creative fun to be had right up until the credits roll. 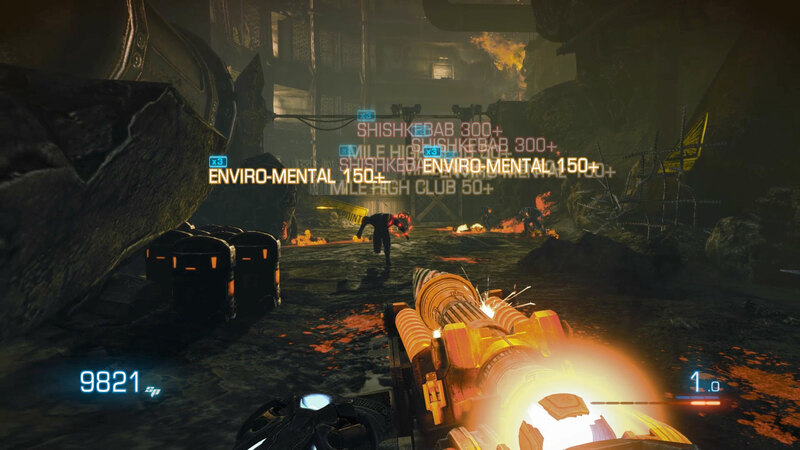 Skillshots are also crucial to getting through the seven acts of the game’s campaign, since the points you pick up for showing off your destruction skills can be spent at stations – known as “dropkits” – dotted throughout the game on unlocking new weapons, refilling ammo, or upgrading your current arsenal. New weapons become available for purchase with your points as you progress through the game, but you can only carry three at a time. Making the right decision about whether or not you’ll need that upgraded and fully-charged Boneduster quad-barrelled shotgun before you reach the next dropkit can be the difference between charging through a section like a pro, or falling at the first sign of trouble. As you’d expect, the visuals have been upgraded to great effect here and the whole thing runs at a relatively solid 60fps. Six new maps have been thrown in for Echo mode – which is a high score challenge featuring portions of the main campaign – and upon completing the game proper, you’ll be able to run through it again in the new “Overkill Campaign” mode. This is pretty much identical to your first run through, only you now have access to the full range of weaponry at all times. The main addition that has been causing the most noise in the run up to launch though, is the pre-order-bonus Duke Nukem content. Jon St John returns to voice Duke, who replaces the lead character in the campaign. Most will be happy that the developer has included the ability to switch back to the standard lead without losing progress, given that the implementation is absolutely dire. The characters around Duke all still refer to him as “Gray” or “Grayson” and cutscenes haven’t been altered to accommodate Nukem’s alternate dialogue. So Duke is mouthing the words that Gray would usually say, but the voiceover isn’t even close to matching up, giving the effect of a terribly, terribly dubbed kung-fu movie. 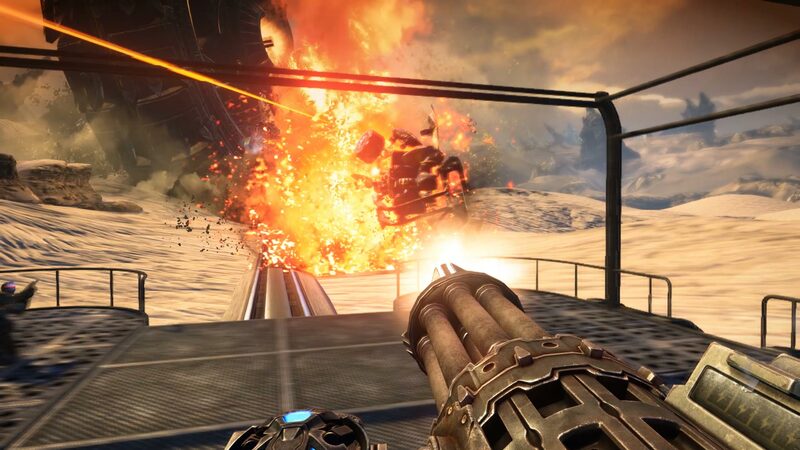 This half-baked extra is – sadly – the largest addition to be found in Bulletstorm: Full Clip Edition and the fact that it’s currently limited to being a pre-order bonus is somewhat insulting, especially when you consider that as a whole, the package offers very little over and above the original game. The modernized visuals and smoother frame rate are more than welcome of course, but there’s a chance that the lack of anything substantial being added to the mix will mean that players who took the plunge first time around will feel somewhat short-changed. For those who didn’t experience Bulletstorm’s violent, blood-covered ballet, though, this is as good a time as any to dive in and get acquainted with one of the most criminally overlooked titles of the last generation. The remaster could definitely have been better and included more bang for your buck, but the underlying quality of the game itself shines through.